A tacodilla is a cheese quesadilla, folded and filled like a taco. Brilliant. Think grilled cheese sandwich folded around a spicy, savory filling and you get the idea, sort of. But it's more than that, eating a tacodilla is a whole different food experience. If it's not an official and recognized culinary offering, it should be! I first found this term here, and immediately loved the concept. Then a Google search turned up 4200 more links for tacodillas. 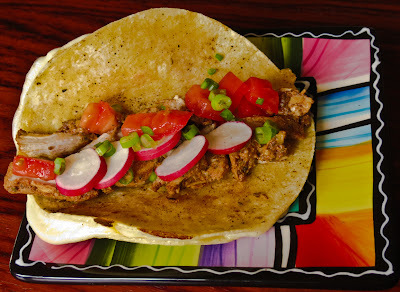 It was obvious that while this notion was new to me, scores of other taco lovers already knew about tacodillas. Why didn't I think of this practical, street truck approach to tacos? Corn tortillas, my favorites, are often flimsy and can fall apart when used singly in tacos. Doubling them up helped to keep the filling intact, but it was still a messy challenge to eat a corn tortilla taco with your fingers. This tacodilla features a New Mexican pork filling (carne adovada) with a handful of chopped vegetables for crunch. 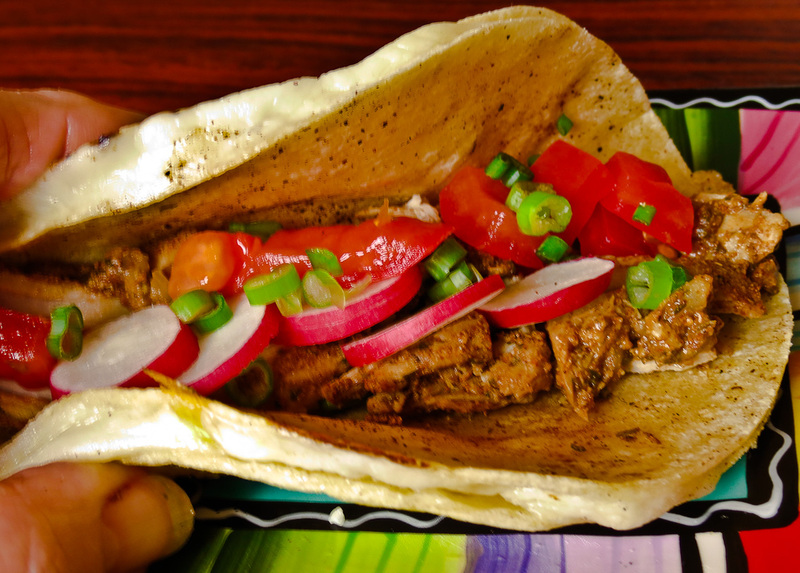 It's still waiting for a squirt of lime juice, or a drizzle of a cilantro sour cream sauce, or even a bit of guacamole. I'll bet you can't eat just one. Really! There are countless endings to that phrase (link), but I'll work on my own kitchen version. The six giant lemons in the photo are from a friend's Yuma, Arizona orchard. Thanks, TS. The puny little specimen in the lower right was advertised as a "large" lemon at a local Seattle grocery. I guess there's large and there's Arizona homegrown large. 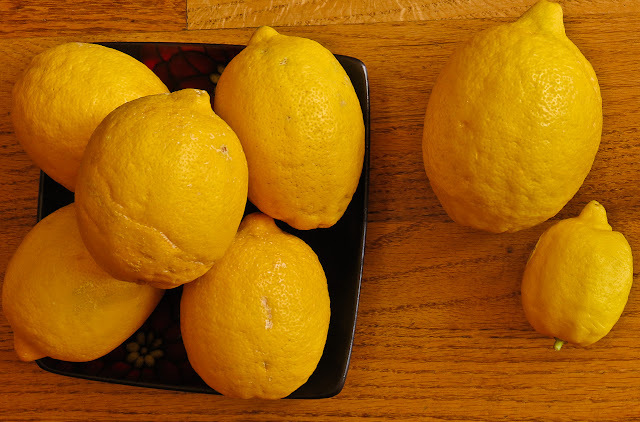 With lotsa lemons in my kitchen - now what? I'm reveling in thoughts of lemon zest or gremolata on everything, lemon to squirt on fish, lemon to flavor cookies and cakes, lemony pasta, Hollandaise sauce, lemon bread... For now I'll just store them carefully and ponder the possibilities a little while longer. This month's Daring Cooks Challenge felt like round two of Chopped, the TV program where contestants create a dish using items from a basket of unrelated ingredients. Our nine choices were familiar food products, many routinely stocked in the pantry, but combining them took some thought. Mandatory Items: You must create an original main course that uses at least one ingredient from each of the three lists below. I procrastinated for days, waiting for my subconscious to be creative and produce something unique. No help there, my culinary brain was either napping or on vacation. Fine! start with something, anything, and get cooking. Parsnips? too sweet. Eggplant? not my favorite. Cauliflower? yes, spiced and roasted cauliflower would be the base of an entree or two. I cut four thin fan-shaped slices from the center of the head, seasoned both sides, and pan-roasted them in a skillet until both sides were toasted and colorful. Ooh, they were pretty. Drizzle them with a sauce for my entree? Use them to top a pizza or tartine? Stack them with goat cheese, dressed greens and other roasted vegetables for lunch? I saw some recipe possibilities here. 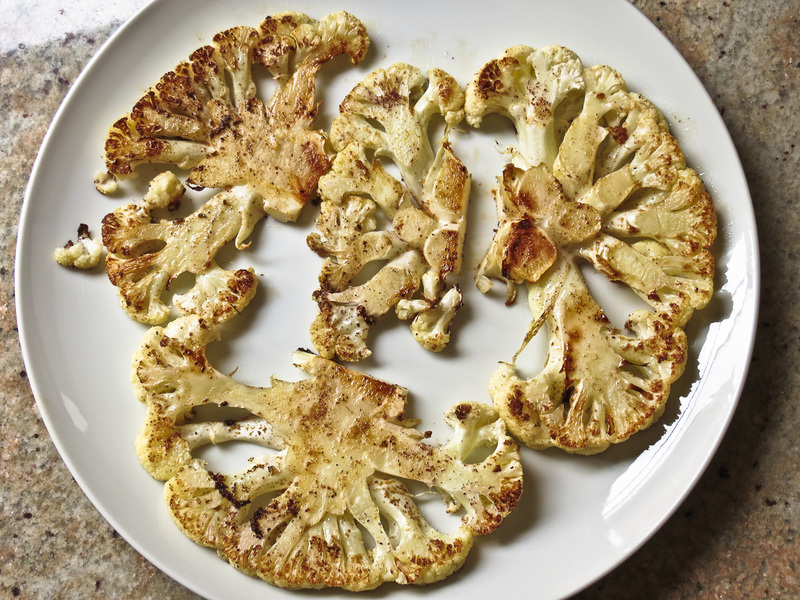 The remaining florets were sliced, tossed with a bit of olive oil, salt and bold seasonings, then oven-roasted until browned. 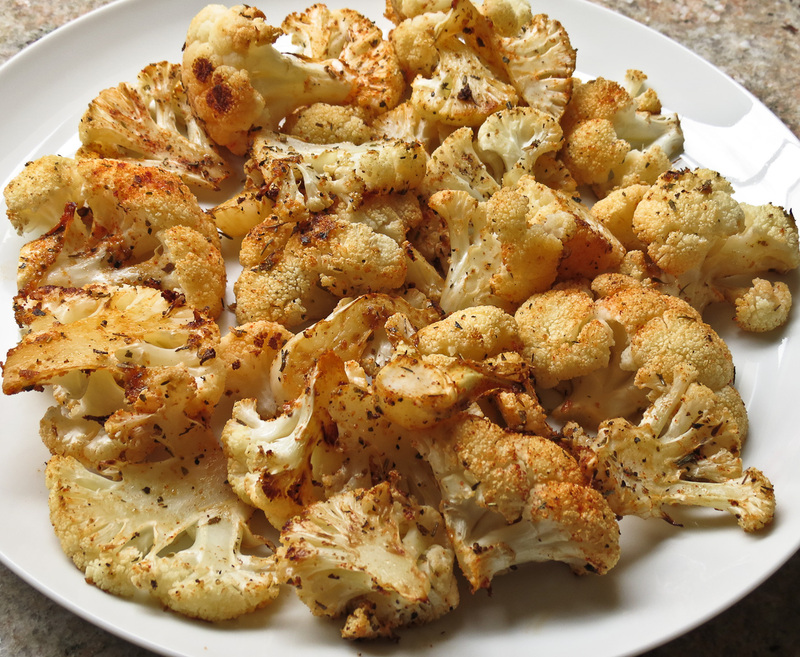 Cumin and smokey chipotle perfumed the kitchen as the cauliflower roasted, I couldn't wait to sample a few. I was ready to stop here, to grab a fork, forget the challenge and finish the entire plate of spicy vegetables. I didn't, but oh my! it was tempting. I still had to deal with the List 3 "weird" ingredients and declared bananas just too weird to work with. 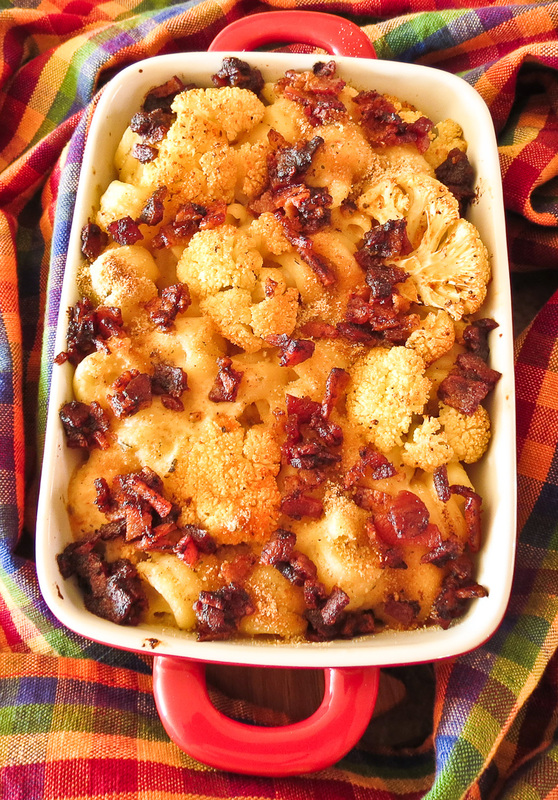 Instead I selected maple syrup to pair with balsamic vinegar in a reduction to coat bacon and create a topping for Cauliflower Mac 'n Cheese. The dish held an interesting mix of flavors, sweet, salty, spicy and rich. How could anyone resist chipotle, two cheeses, a balsamic reduction and bacon? I'm still partial to the roasted spicy cauliflower florets all by themselves. Cumin, Spanish paprika, mixed Italian spices and a generous dash of salt jazzed up this rather plain vegetable. 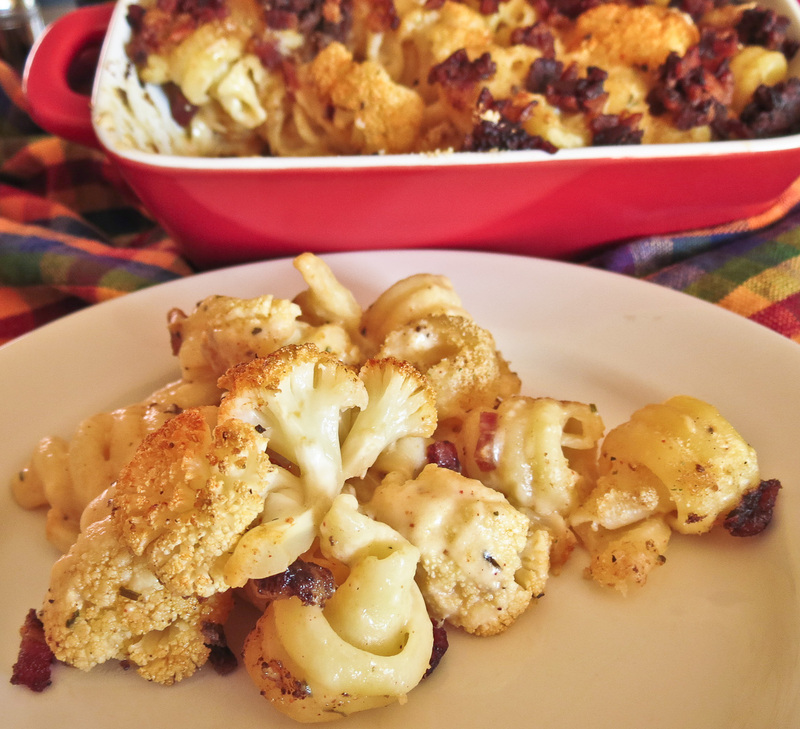 I'll keep future Mac 'n Cheese dishes cauliflower-free, but it was fun to "mess around" and think outside the box this month with flavor and ingredient combinations. What? no recipe? Nope, this was a fun experiment, but definitely not a keeper. 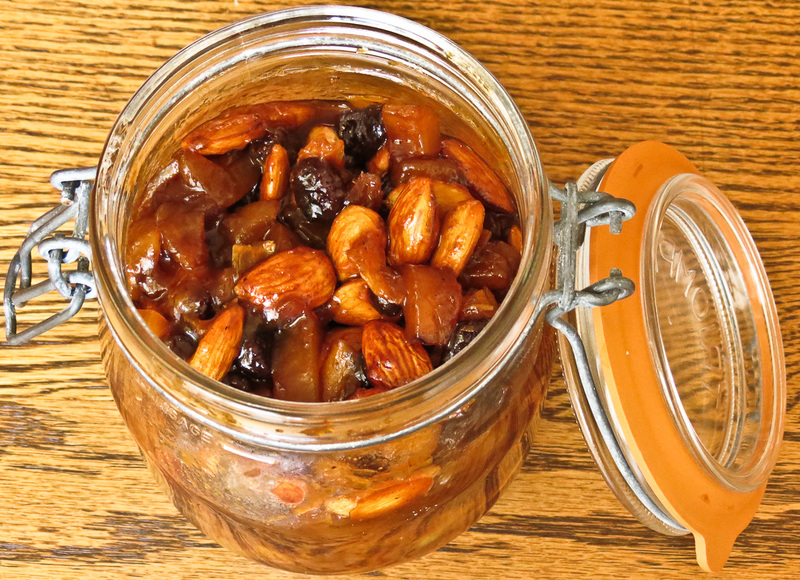 I couldn’t resist the temptation to update the chutney story, to add a note explaining how we have used this condiment lately, and add a few photos. 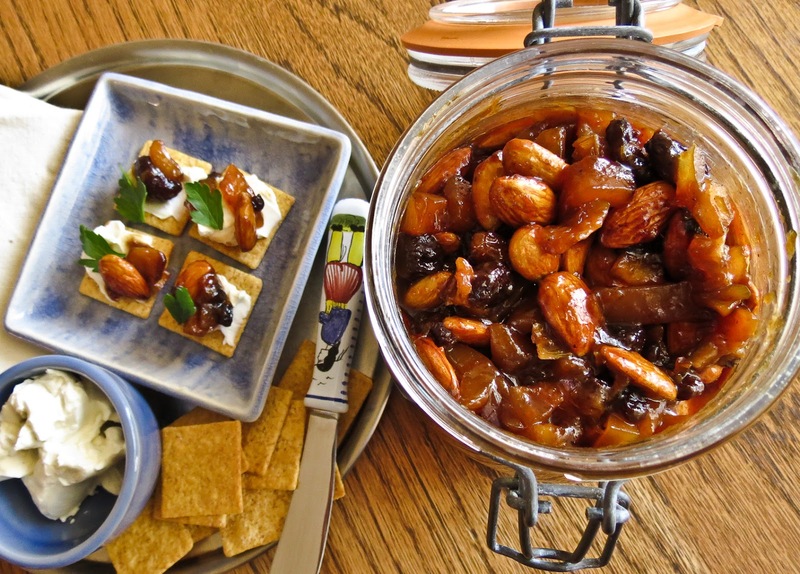 It seemed a good idea while there was still a little chutney left in the jar. A very little. ...the base layer in a chicken chutney sandwich. 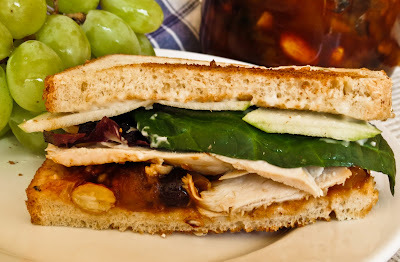 Stack thin slices of chicken breast, a layer of greens, very thin tart apple slices (I recommend Granny Smiths), and a bit of Brie or Havarti cheese between slices of whole grain bread. Toast the bread separately in a toaster or press the prepared sandwich in a panini press - either way this sandwich is a winner. ...a topping for a block of cream cheese and served with crackers, crispy wontons or tortilla scoops. 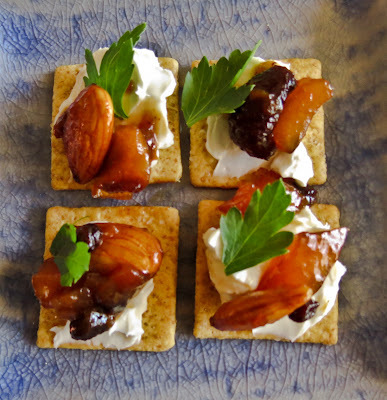 These appetizers disappear fast. ...a condiment to accompany Hawaiian meatballs, lamb curry, chicken wraps, and even top a biscuit or a plain bowl of rice. I also suspect an unnamed kitchen visitor (I'm looking at you, RL) eats chutney straight from the jar with a tablespoon when no one is looking. Of course that's just an unfounded suspicion. I am puzzled about the whole Easter Bunny thing. If we celebrate with baskets of colored eggs on this holiday, shouldn't we be talking about the Easter Chicken instead? Just a thought. 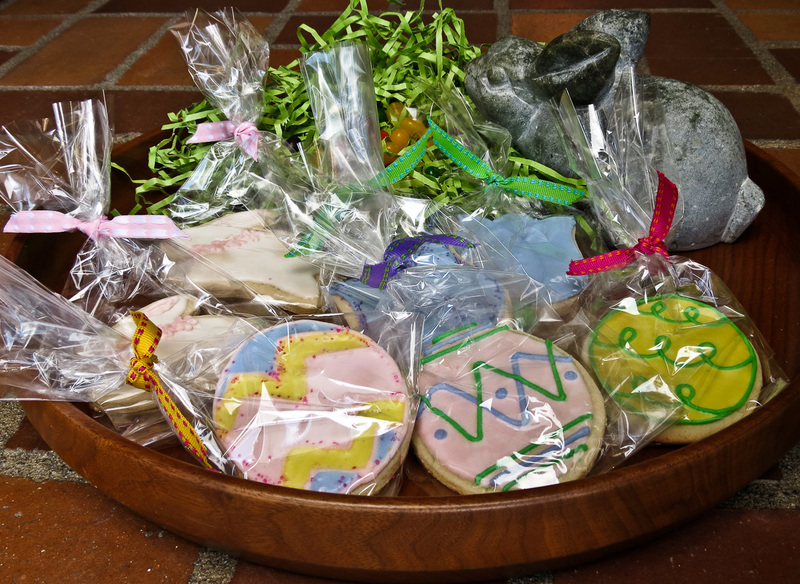 Our eggs arrived already decorated this year, in cookie form, thanks to H. They were beautiful in their beribboned packaging, delicious to eat, and hooray! we have no leftovers to worry about. 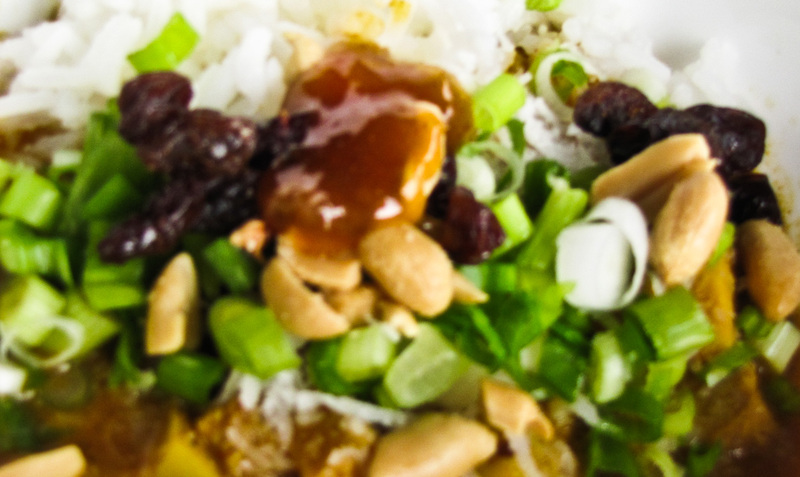 Unlike the challenge of leftover hard-boiled eggs. It happened again, a tempting little package of chile-flavored dried mangos jumped into my shopping cart at Trader Joes. I know it wasn't on my shopping list, it just... happened. Was mango chutney on my mind, some food memory that popped up and transferred into action? Whatever the motivation, the resulting chutney was delicious. Batch #1 of Spicy Mango Chutney had disappeared rapidly, spoonful by spoonful as we "adjusted the seasonings to taste." This second batch looked and tasted quite different, not better or worse, just different. Brown sugar replaced honey on the ingredients list and might account for some of the color difference. The citrus notes from a single lime and one small orange tipped the flavor balance away from sweet and slightly toward sour, a nice variation. Batch #2, Tangy Mixed Fruit Chutney, was still cooling on the counter when H. arrived for a visit. We did an official chutney taste test, sampling this latest version first on a teaspoon, and then topping smears of cream cheese on cracker after cracker. We agreed, this recipe is a keeper. There was a minor kitchen disaster however, an operator error kind of thing. Somehow I neglected to turn the burner off, put the empty but gooey pot back on the stove, and walked away. You know what happened next, right? The acrid smell of burnt sugar was my first hint of a problem. Sure enough, the grooved, nonstick inner base of the pot now sports a hardened crust, firmly welded to those rings and grooves. Sigh! one more kitchen project to add to the To Do list. Suggestions anyone? Chop the fruit (except the lime) into similar-sized chunks, about the size of a very large, fat raisin. Dice the lime (include both fruit & peel) into tiny slivers. Add cider vinegar, apple juice and sugar to a large, heavy-bottomed pot. Heat over medium heat until just boiling, stirring until the sugar melts. Add the cinnamon stick, curry and ginger; heat and stir briefly to incorporate. Add the fruits and onion and return the pot to a boil, stirring occasionally. Reduce the burner heat to the lowest setting possible, and simmer until the dried fruit is rehydrated, the lime peel softens and the liquid is reduced and thick, about 25 minutes on my stovetop. Add more liquid if needed. 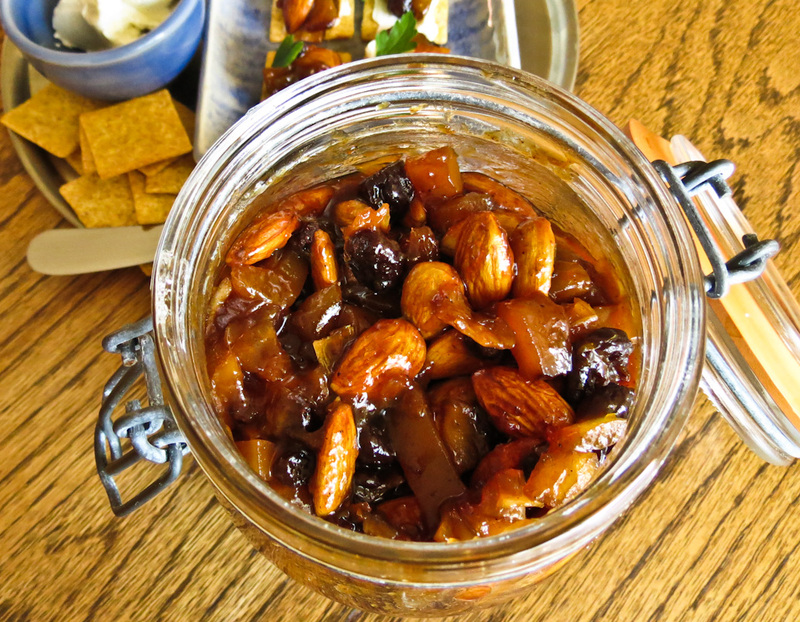 Remove from the heat, add the almonds and let cool. Stir again to distribute the nuts. 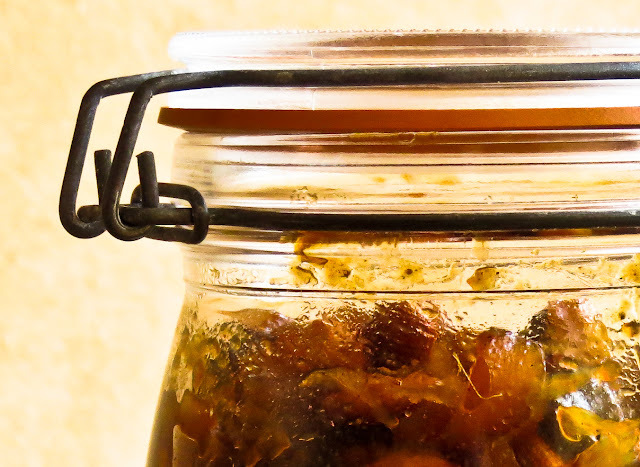 This chutney needs to be stored in the refrigerator and it’s recommended to hold it for at least a day to let the flavors blend. These pancakes were the perfect antidote to breakfast boredom. After a week of mango smoothies every morning, I was more than ready for a change of menu. Not that I'm swearing off smoothies, oh no, just not every day. RL was all in favor of something different too, anything different, just nothing "weirdly different", please. We do have wildly different ideas of what's suitable for breakfast. 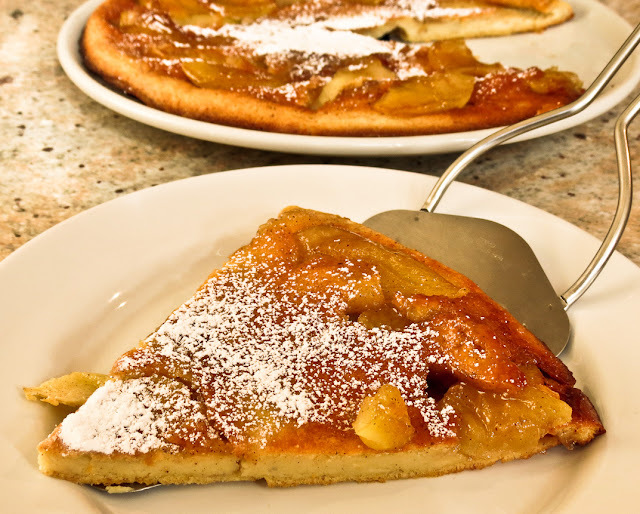 Caramelized apples sounded tempting, and that brought Tarte Tatin to mind, but only briefly. Pastry dough seemed like too much effort for a weekday breakfast. Almost-caramelized apple pancakes would be close enough, and how hard could that be? I skimmed through several recipes, gathered up the common ingredients, rejecting some suggested items and substituting others and charged ahead. Yogurt? mmmmm, not today. All milk? no, I wanted to incorporate some vanilla soy milk. Salt? no, I used salted butter instead. And so it went, an experiment that turned out better than I could have hoped. With too much batter or too small a skillet for one giant pancake, I decided to make two of medium size. 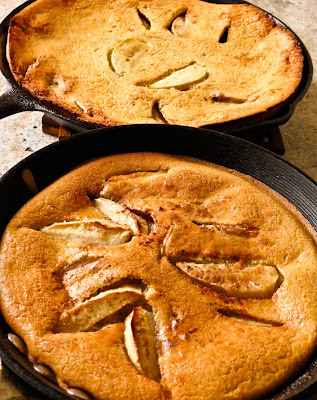 One pancake baked in a cast iron skillet, the other in a Circulon nonstick skillet. Both cooked in the same amount of time, both released from the pan easily, but they looked quite different. 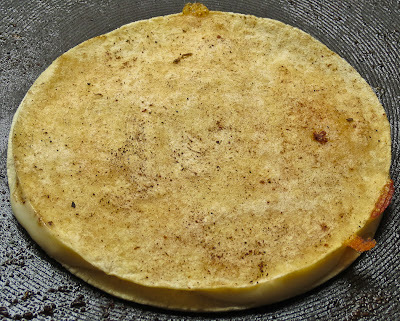 The cast iron skillet pancake had a sunken center and the nonstick pan pancake puffed up. Hmmm, something to ponder. Next time I might use fewer eggs, add some lemon zest and skip the nutmeg, etc. But for certain, we're going to enjoy Apple Skillet Pancakes again. They are now family favorites and would be a good choice for an easy-to-prepare breakfast to serve overnight guests. ...but flipped over onto a serving plate, those caramelized apples really shine! I wonder, why did one pancake sink and one puff in the center? In a large bowl use a whisk to blend the eggs until foamy. In a smaller bowl add the baking powder and sugar to the flour and stir to mix. In a small bowl, combine ¼ cup sugar with the cinnamon and ground nutmeg. Sprinkle this mixture over the butter. Line the pan with apple slices. Sprinkle the remaining ¼ cup sugar over the apples. 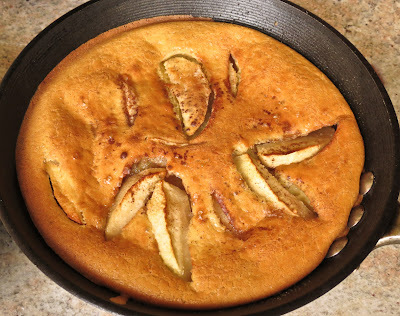 Place the skillet in the oven or on stovetop over medium-high heat until the mixture bubbles vigorously; then remove from the heat and gently pour the batter mixture over the apples. Immediately place the pan in the preheated 425 degrees F oven and bake for 15 minutes. Reduce heat to 375 degrees F and bake for 10 more minutes. Remove from the oven and let sit a few minutes. 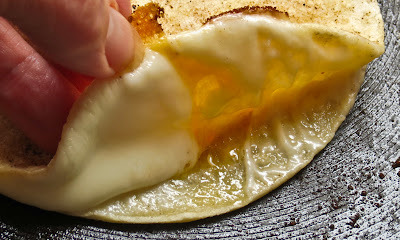 Either (1) slide pancake onto serving platter or (2) invert onto a serving platter and cut into wedges. If your 6-inch pans are pretty and the appetites are large, you could serve the pancakes in the skillet, but those apples in caramel sauce really deserve to be showcased, face up on a plate. Sprinkle a dusting of powdered sugar over the top and serve with lemon wedges… this pancake doesn’t need any syrup.